The Dividist initiated this exclusive club during the 2008 election cycle and recycled it in every federal election since. It was an ignominious start, with the Democrats seizing unified control of the federal government. The 2010 edition was barely posted in time for the midterms among much angst and gnashing of teeth. Can't complain about the result though, as divided government was emphatically restored. We managed an earlier start on the 2012 membership drive, and that worked out fine with the reelection of Barack Obama and divided government. In 2014, it was just a question of how divided we were going to get. The Democrats accommodated by digging themselves an even deeper hole in Congress, much to the delight of our 2014 Midterm United Coalition of the Divided. Now it's 2016. We know why we should vote for divided government. We know how to vote for divided government. 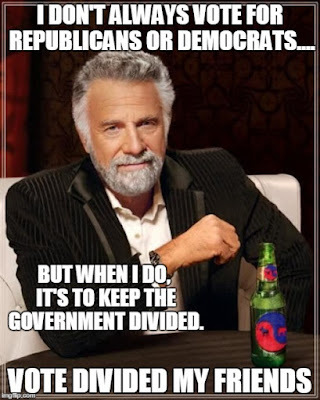 We just need enough of us to actually vote for divided government. This cycle we'll be voting for a new President with the Republicans in majority control of Congress. At the time of this writing, Republicans and Democrats are focused on eating their own. 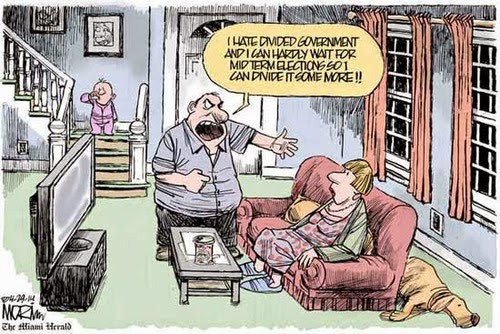 Soon Democrats will realize that a divided government state is the best they can hope for in this cycle. As always, the Dividist will welcome with open arms all disingenuous, insincere, and hypocritical partisan Democratic and Republican Party pretenders to the 2016 United Coalition of the Divided! Membership is open to anyone writing anything in any form in any media in a vaguely positive way on the subject of divided government. New recruits will be added to the ranks, updating this post and blogroll from now until the 2016 election. 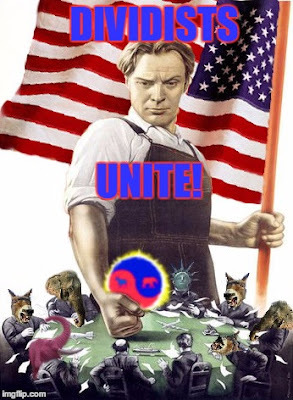 You too can join this glorious movement and march in solidarity with the many millions thousands hundreds tens of your brothers and sisters standing shoulder to shoulder with the United Coalition of the Divided! Just write anything vaguely favorable to Divided Government and/or Gridlock, then let the Dividist know where to find it in the comments or via e-mail. The Dividist will add it to this post, link you, blogroll you, favorite you, follow you, friend you, tweet you, paint your house and walk your dog. This is an active, growing list. New recruits and draftees will be updated to this post and in the blogroll periodically between now and election day. Stay divided my friends. Twitter - Christina Clift Lee Hsien Loong - Singapore P.M.